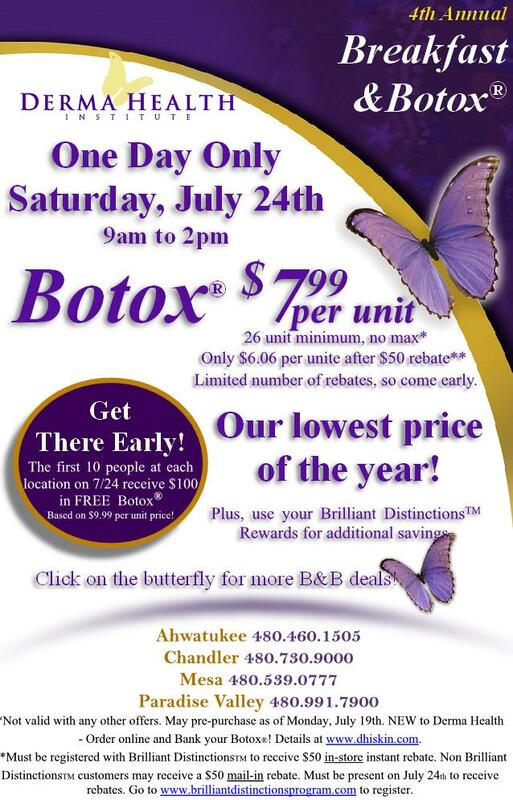 Botox® will be only $7.99/unit (26 unit minimum, no maximum) for this special one day offer. Additional discounts may be available. Also, the first ten people who show up to Breakfast and Botox®, at each location, will receive $100 of BotoxÒ for FREE (based on regular price of $9.99 a unit.) There will be great deals on other products as well, such as Juvéderm® and Latisse®, including free Latisse® Eyelash Lengthener with the purchase of two or more syringes of Juvéderm®. All laser services will be 35% off too. Looking for a quick treat for your skin? Indulge in a Papaya Coconut Express Facial for just $39. Breakfast muffins, pastries, flavored coffees, orange juice and mimosas will be served. All of the employees at Derma Health Institute are trained, licensed and certified medical and aesthetic professionals. In 2009, Derma Health Institute was honored as a Black Diamond Level provider of Botox® and Juvéderm®, by Allergen, the company that produces the products, which distinguishes them as one of the largest providers of Botox® andJuvéderm®, in the country! Derma Health Institute offers other services such as laser hair removal, laser vein removal, microdermabrasion, photofacials and laser genesis for wrinkle and acne scar reduction. Popular new services include the HCG Ultimate Fat Burning Diet and Melanage to treat melasma. Derma Health Institute always provides customers with free consultations to determine their skin needs. This entry was posted in blog and tagged ACNE, BOTOX, DERMA HEALTH INSTITUTE, JUVEDERM, laser genesis, MICRODERMABRASION, vein removal. Bookmark the permalink.